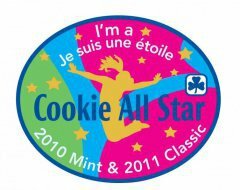 And the top Cookie All Star Unit in Canada is the 1st Europe 2011 Independent Unit, hailing from Thunder Bay, Ontario. This is a special Unit made up of girls in different Thunder Bay Units, created to fundraise for a trip to Europe in 2012. Three girls in the 1st Europe Unit rank in the top 10 of our Cookie All Stars. Congratulations to all of our girls for flexing their entrepreneurial muscles and selling 5,142,624 boxes of cookies! That’s one for the record books! In all, 84 Members earned the top Cookie All-Stars prize of an Asus net-book computer, selling a combined total of 7,027 cases of cookies. And of course, a special thank you to all of the cookie lovers and Girl Guide supporters that make all of this possible!